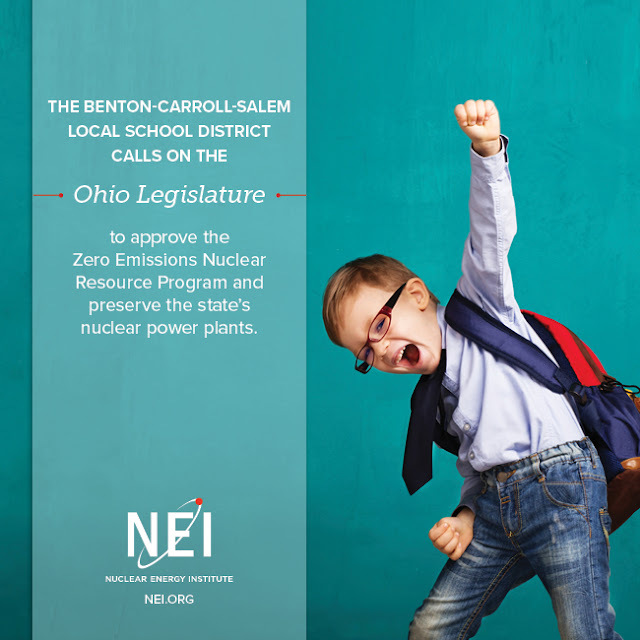 Ohio faces a decision soon about its two nuclear reactors, Davis-Besse and Perry, and on Wednesday, neighbors of one of those plants issued a cry for help. The reactors’ problem is that the price of electricity they sell on the high-voltage grid is depressed, mostly because of a surplus of natural gas. And the reactors do not get any revenue for the other benefits they provide. Some of those benefits are regional – emissions-free electricity, reliability with months of fuel on-site, and diversity in case of problems or price spikes with gas or coal, state and federal payroll taxes, and national economic stimulus as the plants buy fuel, supplies and services. Some of the benefits are highly localized, including employment and property taxes. One locality is already feeling the pinch: Oak Harbor on Lake Erie, home to Davis-Besse. The town has a middle school in a building that is 106 years old, and an elementary school from the 1950s, and on May 2 was scheduled to have a referendum on issuing bonds to replace both in a modern building. Parts of the old buildings look stately but the concrete is crumbling, and they do not meet modern needs for security, access or 21st century instructional methods. But the school board, seeing the uncertainty, canceled the vote. Davis-Besse Nuclear Power Station employs 700 people full time, with an average annual pay of $86,000 before benefits. Keeping it in production will generate nearly $30 billion in economic output to the state. Next week the legislature in Columbus is scheduled to begin hearings on a bill that would correct some of the market flaws, as New York and Illinois have done in the recent past, and as New Jersey and Connecticut are now considering. NOW, THEREFORE, BE IT RESOLVED, that the Benton-Carroll-Salem Local School District Board of Education supports the work of Ohio legislators as they work on plans to help preserve our state’s baseload nuclear plants known as the Zero Emission Nuclear Resource Program (ZEN).